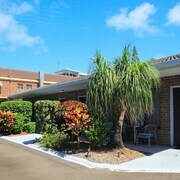 What a great little Motel in the heart Mooloolaba Close to the Beach,shops & restaurants, and enjoy my 2 nights a week stay, as I am working at Maroochydore shopping centre redevelopment & to Break up my travel back to Brisbane. 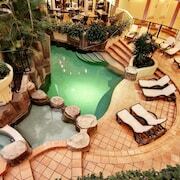 Perfect holiday spot! Location was great. Staff were fantastic. Room was amazing!! Definitely will be back!! Are you the sort of traveller who prefers to roll like Kimye or keep things chill? 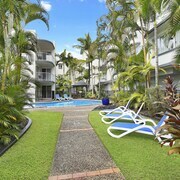 No matter your flavour or budget, lastminute.com.au has some sweet hotels waiting for you in Mooloolaba, 30 kilometres from Sunshine Coast. 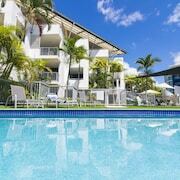 Pack your camera, hat and sunnies, and make your way to Point Cartwright for a relaxing time in the sun. 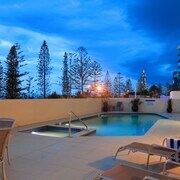 If you want to sleep nearby, two fantastic options are the Oceans Mooloolaba and Alexandra on the Pacific. Nothing quite compares to the tranquility of lounging by the water. 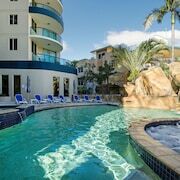 Be sure to go to Mooloolaba Beach. The Aqua Vista Resort and Beach Club Resort are a few of the most sought-after accommodation options to look into around here. You definitely don't need soft, fluffy towels, a delicious room service menu and plush cotton sheets all of the time (that said, you are on holiday, right?). 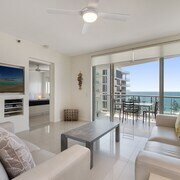 The upmarket options here are the Raffles Mooloolaba and Sailport Mooloolaba Apartments. Holidays! They're all about ditching the tinned food and cordial and treating yourself. Why not start off with a caffeine fix and a mouthwatering snack nearby at Three Musketeers? Chances are you'll all be famished by the time dinner comes around, so why not make a reservation at Domino's Pizza Mooloolaba? Whatever you feel like, the chefs will take good care of you here. If all that grub has left you a tad thirsty, Your Place Espresso & Bar is practically around the corner. It's a great place to grab a stool and get to know the locals! 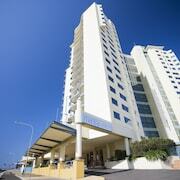 Don't pull your hair out if you can't secure the right Mooloolaba hotel room. You'll discover more accommodation options nearby. 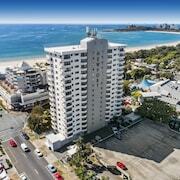 Minyama is 2 kilometres from Mooloolaba, and Alexandra Headland is 2 kilometres away. 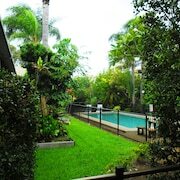 So, have a quick peek at the Mooloolaba weather report, pack your favourite outfits and get moving! You're just a couple of clicks away from wild nights and jaw-dropping experiences!